The 4-star Hotel Beaurivage in Cattolica features a large outdoor pool with hydromassage, a garden with tropical plants and a gazebo, a wellness center and a panoramic terrace with direct access to the beach. Admits small animals. The Hotel Beaurivage is located on Cattolica beach which can be accessed directly from the panoramic terrace. In a few minutes walk you reach the center and the pedestrian area with shops and clubs. The rooms are equipped with WI-FI, satellite TV and digital terrestrial, safe, air conditioning, direct dial telephone, minibar, private bathroom. SUITE: on the top floor of the hotel, balcony with sea view, living room with sofa bed, double shower, double sink, chromotherapy, 48 "LCD TV, safe with security code.You can choose between" Star "(16 sqm, without living room or double sink and shower), "Space" (33 sqm), "Moon" and "Sun" (37 sqm). STANDARD: large balcony, soundproof windows. They are divided into "Classic" (20 square meters), "Quality" (20 square meters, with side sea view) and "Sea front" (26 square meters, terrace with panoramic sea view). LARGE: available in the "Family" version (35 sqm, with 2 balconies overlooking the pool and partial sea view) and "Apartment" (46 sqm). This last solution is composed of 2 connecting rooms with independent entrances, shared bathroom and 3 large balconies with pool view and side sea view. 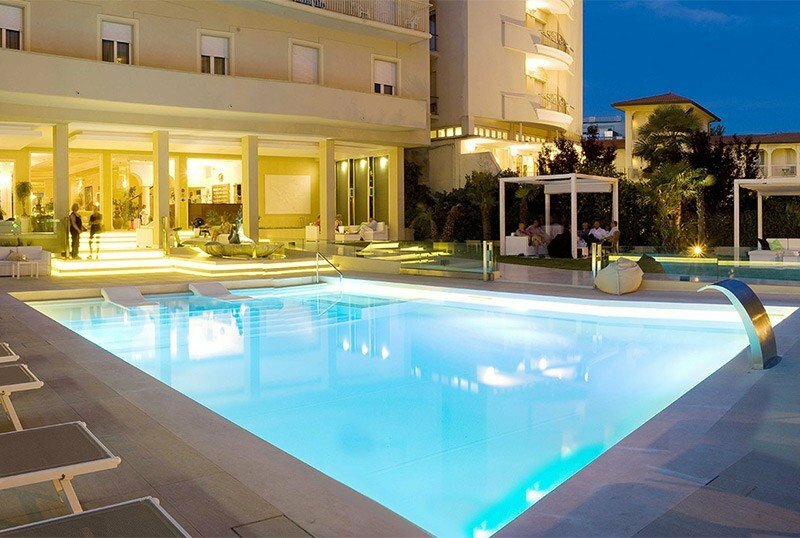 The hotel has a garden with swimming pool, spa, panoramic terrace, solarium, open-air porch, free bicycles, reading room with newspapers available, conference room, bar, elevator, laundry, beach towel, theme nights (evening Romagna and evening with buffet of desserts by the pool). PARKING: uncovered, private, 150 m, free. Garage in the hotel, subject to charge, subject to availability. SERVICES FOR DISABLED: entrance on the ground floor with a sloped ramp, a standard elevator, a room with a wheelchair maneuver and a wheelchair access shower. LUNCH AND DINNER: menu with 3 or more choices, buffet of appetizers and side dishes, cakes and desserts. Pasta and desserts are homemade. In the hotel: swimming pool in garden, indoor playground area, pediatrician on request. At meals: kitchenette available, baby menu, baby food, seats at the table. At the beach: direct access to the beach, entertainment. The hotel's tropical garden, equipped with a gazebo, houses a 100 m² swimming pool with hydromassage area, sun loungers and a cervical massage blade, WI-FI zones. Wellness area with counter-current swimming pool, hydromassages with different water temperatures, sauna, massages and beauty treatments on request, sun terrace with panoramic views. From the panoramic terrace you can directly reach the beach n. 93, "Malù Beach" with entertainment, sports tournaments, playground areas for children, mini club, baby sitter. 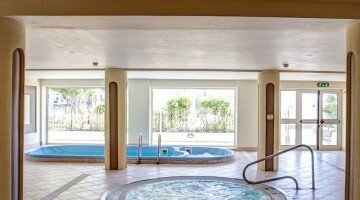 7 days of relaxation for couples in Cattolica! Are you an inseparable couple? Discover the exclusive offer for you. Free aperitif by the pool! € 1,051.00 in All Inclusive. Discover the June offer dedicated to couples and families! Your best offer in July! For a minimum stay of 7 days, double room price.